Localized surface plasmon resonance is generated by metal nanoparticles, typically gold and silver, as compared to a continuous film of gold as used in traditional SPR. OpenSPR is similar in many ways to traditional SPR, and provides the same data using the same experimental conditions and procedures. To the user, everything would seem the same between other SPR instruments and OpenSPR. However, OpenSPR uses what is known as localized surface plasmon resonance (LSPR). Localized surface plasmon resonance is generated by metal nanoparticles, typically gold and silver, as compared to a continuous film of gold as used in traditional SPR. 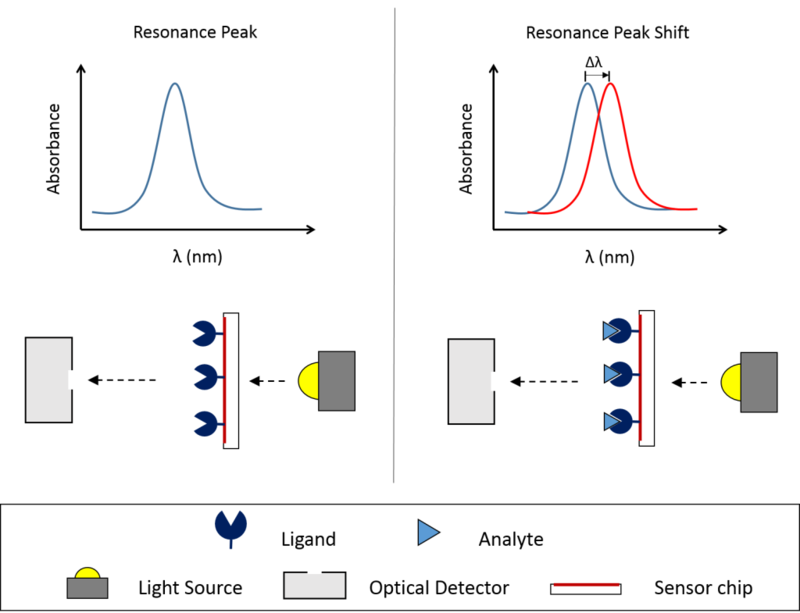 LSPR produces a strong resonance absorbance peak in the visible range of light, with its position being highly sensitive to the local refractive index surrounding the particle. Therefore, OpenSPR measures small changes in the wavelength of the absorbance position, rather than the angle as in traditional SPR. Where ∆n is the difference in refractive index between the absorbed layer and the surrounding medium, and d is the thickness of the absorbed layer. The smaller decay length of SPR versus LSPR is illustrated in the image below. This smaller sensing volume means that LSPR is more sensitive to molecular binding and less sensitive to bulk effects. The smaller decay length and sensitivity associated with LSPR reduces artifacts caused by external variables such as temperature drift or buffer refractive index changes.